Climate Whirl is rooted in the cross-disciplinary research being done at the Helsinki University Hyytiälä forestry field station and SMEAR II station in Finland. The project engages artists to interpret and disseminate scientific knowledge about the interactions between forests and the atmosphere. We specifically regard the influence that boreal forests have on the climate, and we wish to enhance the dialogue between researchers and artists working at these stations. Neither research nor viewpoints are tied to certain disciplines or species. Instead, we look for encounters and interplay between sciences, arts, people, trees and other organisms. The cutting edge research done at the station is documented, and the results are published in international peer-reviewed journals. However, there is a long way from publishing in scientific journals to making the results to public knowledge or discussion. Plenty of interesting research and development does not get the attention it deserves. Climate Whirl seeks and creates opportunities for interactions between scientific and artistic research. We seek to open up research processes and concrete procedures for wider audience. We look for new models of though and action, that might shake traditional ways of making, but that enable encounters in new, different cognitive levels (experience-emotions-knowledge). The project started in 2011. 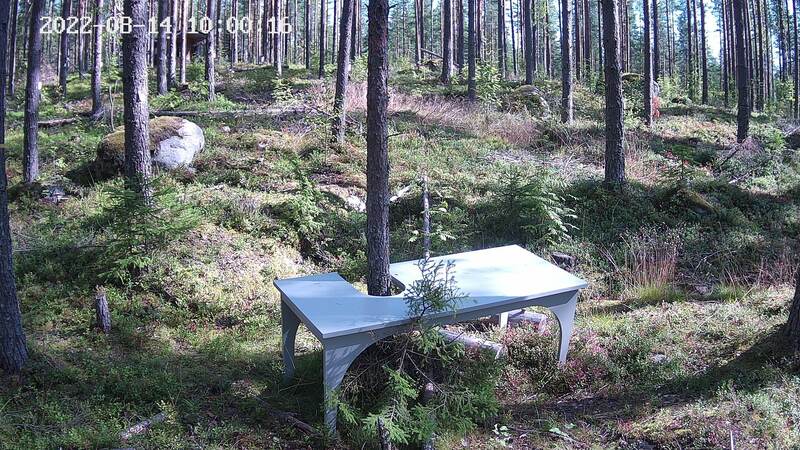 So far the project has implemented interactive carbontree.fi website, and Climate Whirl artist-in-residency, that for the first time was organised at Hyytiälä Forestry Field station in 2013. Other events that are conducted under Climate Whirl include workshops, exhibitions, and seminars. These events bring together scientific and artistic research, and tranfer knowledge outside the expert communities. Agnes Meyer-Brandis was selected the first residency artist of Hyytiälä Forestry Field station. During the residency she created an installation called TeaCup Tools and lead the Tealemetree Workshop. Both are closely linked with the research done at the SMEAR II research station in Hyytiälä. Agnes worked at Hyytiälä during two summers, 2013 and 2014. In August 2015, the 20th anniversary of SMEAR II research station and the opening of Tealemetree Station by Meyer-Brandis were celebrated at the research forest. Forest-Climate-Time event will be organized in Helsinki in April 2017. Climate Whirl is a project between Department of Physics and Division of Atmospheric Sciences at University of Helsinki, and Capsula ry. Project is financially supported by Kone Foundation. Forest, peatland and atmosphere related multi-disiplinary research. Focused on forest and atmospheric explorations. Climate Whirl workshops facilitate encounters and making in the woods. Artistic work has become part of the everyday life of the forest station. Overview of past and upcoming events of Climate Whirl project. The project is featured in the international media and publications.